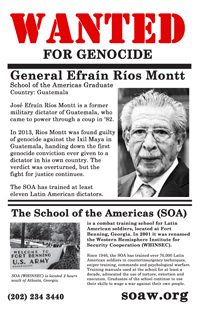 Posted by rogerhollander in Criminal Justice, Human Rights, Imperialism, Latin America. 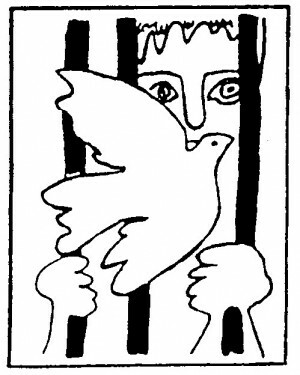 “There is but one law for all: the law of humanity and justice” – Jimmy Carter. To read her full speech from the stage and for contact information for some of the media outlets that Theresa mentioned, click here. To send a message to the media through the SOA Watch webpage, click here. Posted by rogerhollander in Foreign Policy, Honduras, Latin America. On early Sunday morning, approximately 100 soldiers entered the home of the left-leaning Zelaya, forcefully removed him and, while he was still in his pajamas, ushered him on to a plane to Costa Rica. The tension that led to the coup involved a struggle for power between left and right political factions in the country. Besides the brutal challenges facing the Honduran people, this political crisis is a test for regional solidarity and Washington-Latin American relations. When Manuel Zelaya was elected president on November 27, 2005 in a close victory, he became president of one of the poorest nations in the region, with approximately 70% of its population of 7.5 million living under the poverty line. Though siding himself with the region’s left in recent years as a new member of the leftist trade bloc, Bolivarian Alternative for the Americas (ALBA), Zelaya did sign the Central American Free Trade Agreement in 2004. After his election, Zelaya’s left-leaning policies began generating “resistance and anger among Liberal [party] leaders and lawmakers on the one hand, and attracting support from the opposition, civil society organizations and popular movements on the other,” IPS reported. 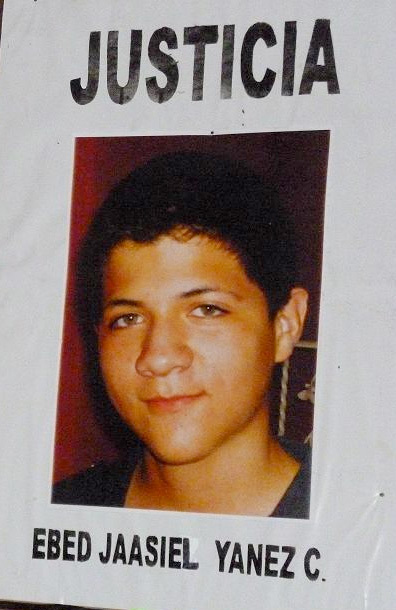 As his popularity rose over the years among these sectors of society, the right wing and elite of Honduras worked to undermine the leader, eventually resulting in the recent coup. The key question leading up to the coup was whether or not to hold a referendum on Sunday, June 28 – as Zelaya wanted – on organizing an assembly to re-write the country’s constitution. Nations across Latin America, including Venezuela, Bolivia and Ecuador, have recently re-written their constitutions. In many aspects the changes to these documents enshrined new rights for marginalized people and protected the nations’ economies from the destabilizing effects of free trade and corporate looting. Leading up to the coup, on June 10, members of teacher, student, indigenous and union groups marched to demand that Congress back the referendum on the constitution, chanting, “The people, aware, defend the Constituent [Assembly].” The Honduran Front of Teachers Organizations [FOM], with some 48,000 members, also supported the referendum. FOM leader Eulogio Chávez asked teachers to organize the expected referendum this past Sunday in schools, according to the Weekly News Update on the Americas. The Supreme Court ruled that the referendum violated the constitution as it was taking place during an election year. 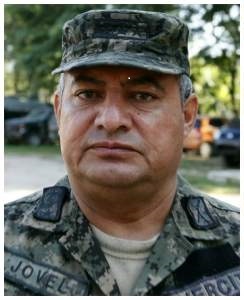 When Honduran military General Romeo Vasquez refused to distribute ballots to citizens and participate in the preparations for the Sunday referendum, Zelaya fired him on June 24. The Court called for the reinstatement of Vasquez, but Zelaya refused to recognize the reinstatement, and proceeded with the referendum, distributing the ballots and planning for the Sunday vote. 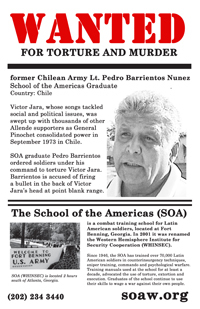 Vasquez, a former student at the infamous School of the Americas, now known as Western Hemisphere Institute for Security Cooperation (WHINSEC), went on to be a key leader in the June 28 coup. 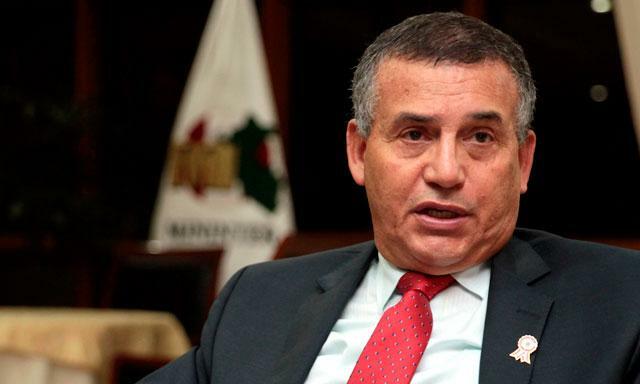 After Zelaya had been taken to Costa Rica, a falsified resignation letter from Zelaya was presented to Congress, and former Parliament leader Roberto Micheletti was sworn in by Congress as the new president of the country. Micheletti immediately declared a curfew as protests and mobilizations continued nation-wide. Since the coup took place, military planes and helicopters have been circling the city, the electricity and internet has been cut off, and only music is being played on the few radio stations that are still operating, according to IPS News. Telesur journalists, who have been reporting consistently throughout the conflict, were detained by the de facto government in Honduras. They were then released thanks to international pressure. The ambassadors to Honduras from Cuba, Venezuela and Nicaragua were arrested. Patricia Rodas, the Foreign Minister of Honduras under Zelaya has also been arrested. Rodas recently presided over an OAS meeting in which Cuba was finally admitted into the organization. The military-installed government has issued arrest warrants for Honduran social leaders for the Popular Bloc Coordinating Committee, Via Campesina and the Civic Council of Grassroots and Indigenous Organizations of Honduras, according to the Weekly News Update on the Americas. Members of social, indigenous and labor organizations from around the country have concentrated in the city’s capital, organizing barricades around the presidential palace, demanding Zelaya’s return to power. “Thousands of Hondurans gathered outside the presidential palace singing the national hymn,” Telesur reported. “While the battalions mobilized against protesters at the Presidential House, the TV channels did not report on the tense events.” Bertha Cáceres, the leader of the Consejo Cívico de Organizaciones Populares y Indígenas, said that the ethnic communities of the country are ready for resistance and do not recognize the Micheletti government. The 4th Army Battalion from the Atlántida Department in Honduras has declared that it will not respect orders from the Micheletti government, and the major highways of the country are blocked by protesters, according to a radio interview with Alegría. “The State Department has requested $68.2 million in aid for fiscal year 2010 [for Honduras], which begins on October 1, up from $43.2 million in the current fiscal year and $40.5 million a year earlier,” according to Reuters. The US military has a base in Soto Cano, Honduras, which, according to investigative journalist Eva Golinger, is home to approximately 500 troops and a number of air force planes and helicopters. Only time will tell what the international and national support for Zelaya means for Honduras. Regional support for Bolivian President Evo Morales during an attempted coup in 2008 empowered his fight against right wing destabilizing forces. Popular support in the streets proved vital during the attempted coup against Venezuelan President Chavez in 2002. Meanwhile, Zelaya supporters continue to convene at the government palace, yelling at the armed soldiers while tanks roam the streets. If you are interested in rallying in support for the Honduran people and against the coup, here is a list of Honduran Embassies and Consulates in the US. People in the US could call political representatives to denounce the coup, and demand US cut off all aid to the rogue government until Zelaya is back in power. Click here to send a message to Barack Obama about the coup. 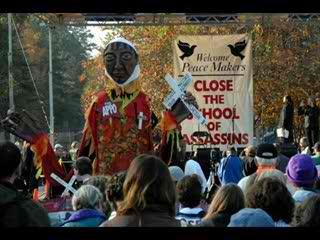 Visit SOA Watch for more photos and suggested actions.